Visit the Trees and Hills table at Lowbrow Craft Fair on December 12 in Northampton, MA. Colin Tedford will be on hand hawking our comics, cards, and magnets — stock up for stockings or get reading supplies for hiding from the holidays. This is our only holiday show this year, so don’t miss it! Having trouble finding time to work on your submission for Trick or Treat Comics #4 ? This is that time! We’ll start off with a brief intro and a brainstorming session for those who don’t have story ideas yet, then settle down to draw. We will meet Sunday, September 13 from 1:00 to 4:00 PM in the haunted food court* at the Colony Mill (222 West Street, Keene, NH), which is at the opposite end from the Toadstool bookstore and the smokestack. You can read about last year’s event at http://treesandhills.org/2014/09/trick-or-treat-comics-workshop-report/. *Haunted by the ghosts of its former eateries — if you want food you’ll have to bring it. Get your spooky pen out – Trees & Hills wants you to help us make our fourth set of Trick or Treat Comics! This set of miniature comics will be perfect for giving to trick-or-treaters or Halloween party-goers. Content: Spookiness, monsters, ghosts, pumpkins, & other Halloween-related stuff (here’s a list of spooky stuff if you need inspiration). Must be suitable for children. Deadline: October 3. Join us for a Trick or Treat Comics-making session in Keene, NH on September 13 with how-to, story idea brainstorming, and of course drawing! Email your comic to organize@treesandhills.org as a set of TIF files, one for each page, with filenames formatted [your last name]-tot4-[page number] (e.g. Tedford-tot4-1.tif, Tedford-tot14-2.tif, etc – the “tot4″ stands for “Trick or Treat #4″). They should be 600 dpi B&W (300dpi greyscale is OK if you’re using ink washes or something). Send clean photocopies to Trees & Hills Comics Group, PO Box 645, Winchester, NH 03470 (but they absolutely have to arrive by the deadline). If you’re unable to produce digital files and don’t have enough time to mail copies, ask nicely and maybe the T&H Mobile Production Unit can scan your comics for you (no guarantees). End result: The comics will be posted online as freely-downloadable print-ready PDFs; you may print as many copies as you want to give away. We will also be offering printed sets for sale, of which we will send you a copy for free. We may at some point reprint Trick or Treat Comics in a bound and digital anthology; if we do we will send you a minimum of one copy. Do not redistribute PDFs or sell copies of anyone else’s comic without their permission; however, you should feel free to sell your own comic individually and/or offer it for download. We look forward to seeing your spooky comics! The first MASSive Comicon happens June 27 & 28, 2015 in Worcester, MA. Exhibitor registration is open. It’s put on by Double Midnight Comics, who also organize Granite State Comicon. Broke Arts Fair applications are open. This year’s fair is June 13 in Peterborough, NH. Broke is an affordable arts fair where all items cost $50 or less; Trees and Hills has tabled at it many times. The SPX 2015 Exhibitor Table Lottery is now open. It will be available for the first two weeks of February and only takes a few minutes. There is no benefit to applying early or late. SPX happens September 19-20 in Bethesda, MD. 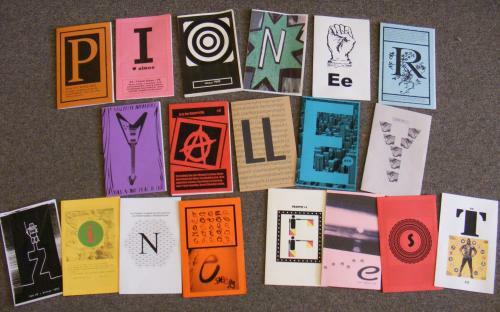 Pioneer Valley Zine Fest happens April 11 10am-4pm at Flywheel Arts Collective in Easthampton, MA. We’ve applied — have you? Wednesday, February 4 in Portland, ME: 12-1 pm Q&A at Portland Public Library and 5-7 pm signing at Casablanca Comics. Thursday, February 4 in Cambridge, MA: 2-5 pm conversation and Q&A at the Brattle Theater. Movie and a Poster 2018 #19: Bad Samaritan.